Here are some takeaways after Democrats won three of four special elections on Tuesday, preventing Republicans from taking control of the House. House pace on Gov. Matt Bevin’s budget likely to continue: On Monday, Bevin took to Facebook to suggest in a video that the House was wasting time on passing his budget, questioning why there was no one in the chamber at 11 a.m. on a Monday. (Both it and the GOP-controlled Senate regularly convene at 4 p.m. on Mondays.) Speaker Greg Stumbo, D-Prestonsburg, said in an impromptu news conference later that the House has been working hard on the bill – but in the Capitol Annex, not on the House floor. With Stumbo’s majority increased, Bevin’s video is not likely to speed up the process. Fall elections will be key: Democrats now hold a 53-47 majority, and Republicans will push again to wrest control of the House from the Democrats in a year that national politics is likely to help them in the state. That said, Stumbo has argued that many Democrats up for re-election are known well by their constituents and because of that are inoculated from the effects of a strong GOP bias at the top of the ticket. Democrats claim victories are a repudiation of Gov. Matt Bevin and his policies: The Democrats claim Bevin’s policies are extreme. The key issue Democrats will use the wins to push back on will be Bevin’s budget, which includes across-the-board 9 percent cuts. “Senate and House Republicans are going to start running away as fast as they can from Bevin’s budget,” said Democratic consultant Matt Erwin. Look for Democrats to use these proposed cuts and their effects on everything from schools to social services when they campaign in the fall. Labor unions were a factor: Conventional wisdom is that much of the bite has been taken away from the state’s labor unions as voters more and more cast ballots on social issues rather than their pocketbooks. 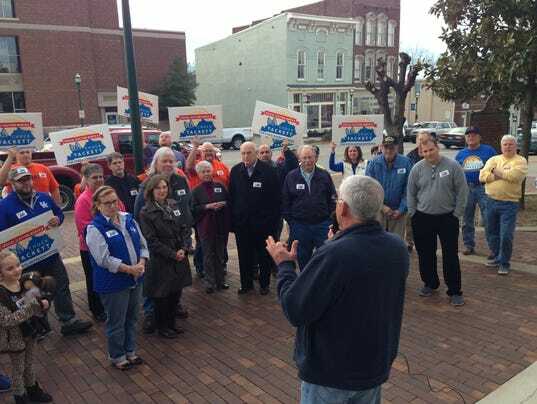 But with the GOP nearing a takeover of the House and promising to pass so-called “right-to-work” legislation – which would allow people to work in union shops without paying union dues or representation fees – the unions were energized, especially in northeastern Kentucky where voters witnessed what has gone on in West Virginia with passage of such laws. President Barack Obama is not toxic everywhere: The day before the special elections, the Democratic National Committee sent out a robocall to Democrats in Kentucky’s 8th District with Obama’s voice telling them they should go out and vote for Jeffrey Taylor. They listened, pushing Taylor to a 1,025-vote victory. Such a strategy likely wouldn’t have worked in Pike County, but it certainly didn’t hurt in Christian County, which has a sizable African-American vote. Would a better GOP effort to turn out Saturday caucus vote have helped? The Republicans didn’t spend money to publicize Saturday’s presidential caucus, but they used it to try to whip up turnout for the special elections. However, with only 17.9 percent of registered Republicans coming out for the caucus, it limited the number of voters they could reach.